We shared this story recently in a letter to a number of folks who partner with us in ministry. But it was too good not to share with a broader audience. I walked out of the Weekend to Remember in Tampa to get a quick breather. Though we were in the sunshine state, I’d yet to experience the coast and the southern sun. The teaching schedule had kept us too busy up to that point – but now we had a break between sessions. The boardwalk outside the doors snaked through a soggy shoreline before opening to a view of the bay. Just as the canopy peeled back and the sun started to thaw my frozen ballroom body, a couple stopped me. “Hey my wife served me divorce papers last month” (she was standing right behind him looking sheepish). “Can you believe she did that?” (Her face said, “Yep, I did that.”) Not a good start to a conversation. Then he shared the rest of the story. He was at home when he heard the knock and just knew it was someone serving papers. The last thing he wanted was to have that happen “in my castle.” So he did what any real man would do to protect his domain – he ran. He dove out the bedroom window, scrambled through a swampy brambled mess that made up his backyard, and called his co-worker to pick him up, barefoot and muddy. They headed for his office to find refuge and arrived just in time find the same court official waiting for him. Oops. But hey – at least it didn’t happen at home. 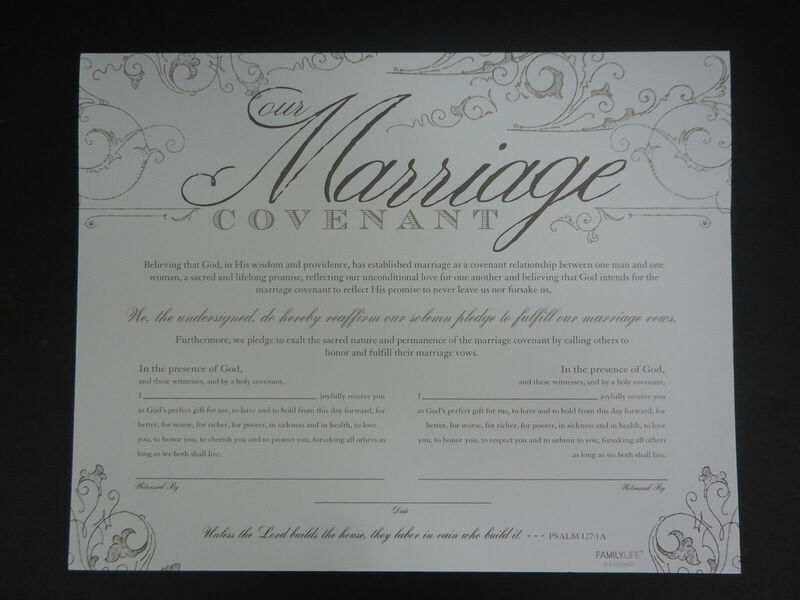 Not our actual covenant – but same idea. I came away from this conversation reminded of something we talk about at the conference – how important it is to avoid the “D” word (divorce) in marriage. Don’t ever threaten your spouse with divorce. Take that word off the table. It always derails the conversations and undermines your commitment to one another. There’s tremendous power in affirming the positive rather than just avoiding the negative. Look for opportunities to do that this week with your spouse, and if possible, in front of your kids.